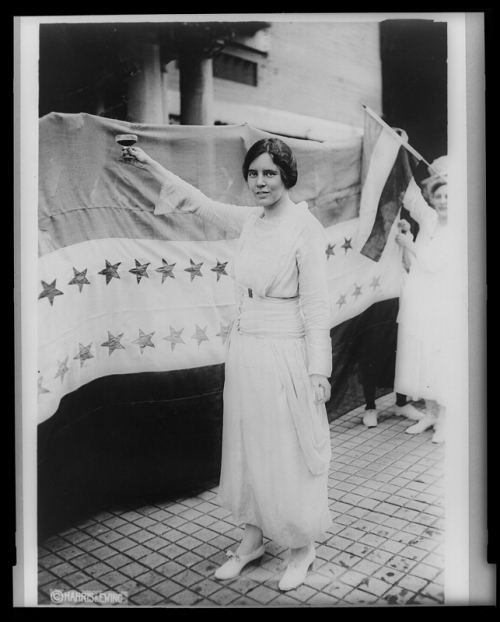 Alice Paul authored the Equal Rights Amendment and founded the National Woman’s Party. Born to Quaker parents, her faith served as a foundation for her activism. In 1907, she moved to Birmingham, England, to do settlement work and pursue studies at the university; while there, she was jailed three times for suffragist agitation. She returned to the United States three years later determined to reform and reenergize the languishing suffrage movement. She advocated militant tactics to obtain a woman suffrage amendment to the Constitution. By 1912, she was chair of the congressional committee of the National American Woman Suffrage Association, but soon tired of their timid strategies. Consequently, she led a breakaway group to form the Congressional Union for Woman Suffrage which, by 1917, became the National Woman’s Party. Paul organized rallies and direct actions, landing in jail several times. After passage of the Nineteenth Amendment granting women the franchise, Paul obtained a law degree and, in 1923, drafted and introduced to Congress the first Equal Rights Amendment. When this failed, she began working through international forums. A new generation of feminists in the 1960s would adopt Paul as an elder stateswoman. Unknown artist. Miss Alice Paul, n.d. From The Suffragist, December 25, 1915. Library of Congress, Prints and Photographs Division, Washington, D.C.